Update: Corrections and more clarification has been added to the original post. The corrections and additional language is marked in red. Thank you to everyone who submitted public comments during our public comment period back in spring! We are wrapping up the review of the public comments submitted during the 75-day public comment period. 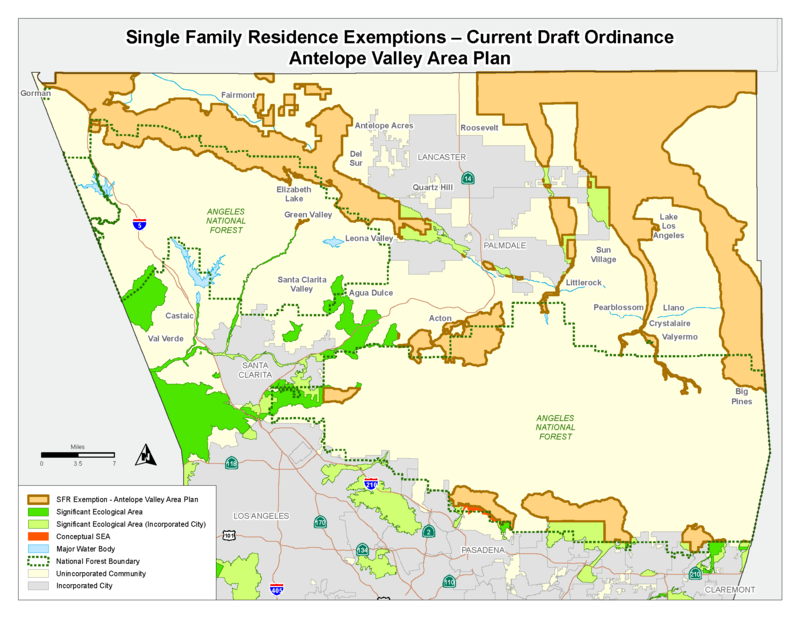 Many of the comments we received expressed that single-family residences and agricultural uses in the Antelope Valley should also undergo SEA review. In response to this feedback, we drafted an alternative option for the AV exemptions that we wanted to discuss with the residents. Please see below for a comparison of the current draft language and the alternative option. 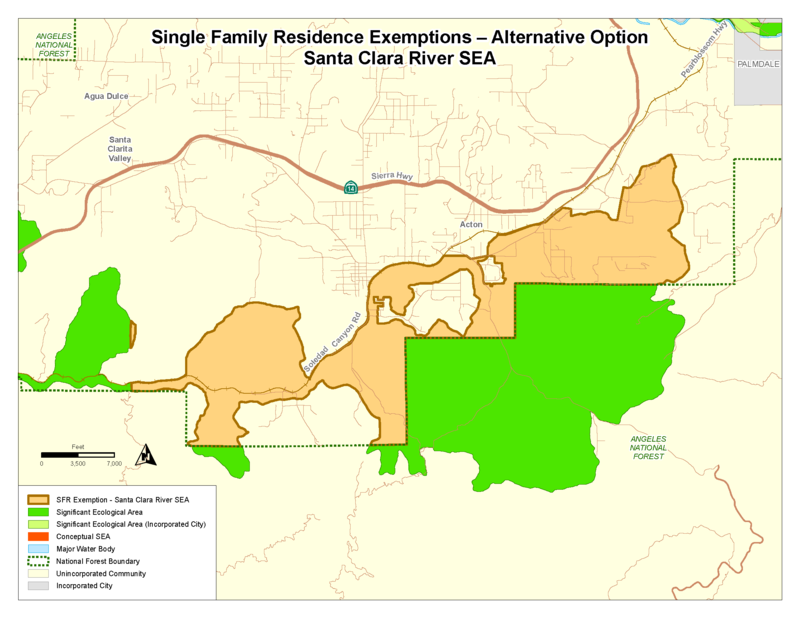 In the current draft ordinance, any new single-family residences, additions, and agricultural uses in the SEAs within the AV Plan boundaries are exempt from SEA review, meaning they will still need to get the necessary land use permits but will not be required to undergo a biological review. 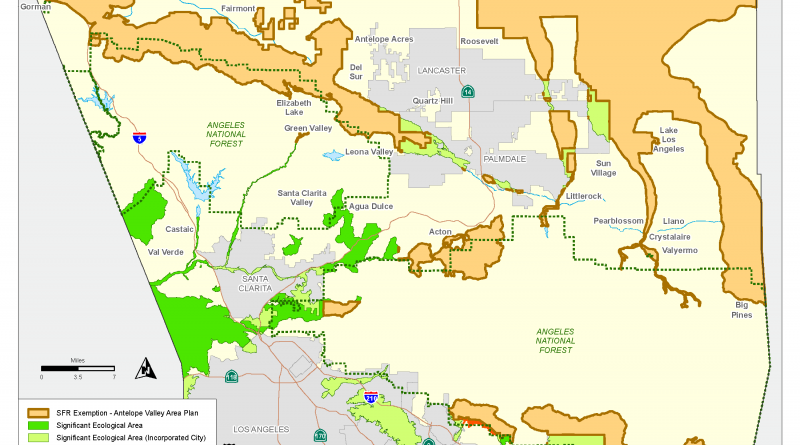 This exemption will apply to SEAs that extend from the border of northern LA county to the southern foothills of the San Gabriel Mountains (shown below in orange). New or expanded animal keeping areas and facilities. 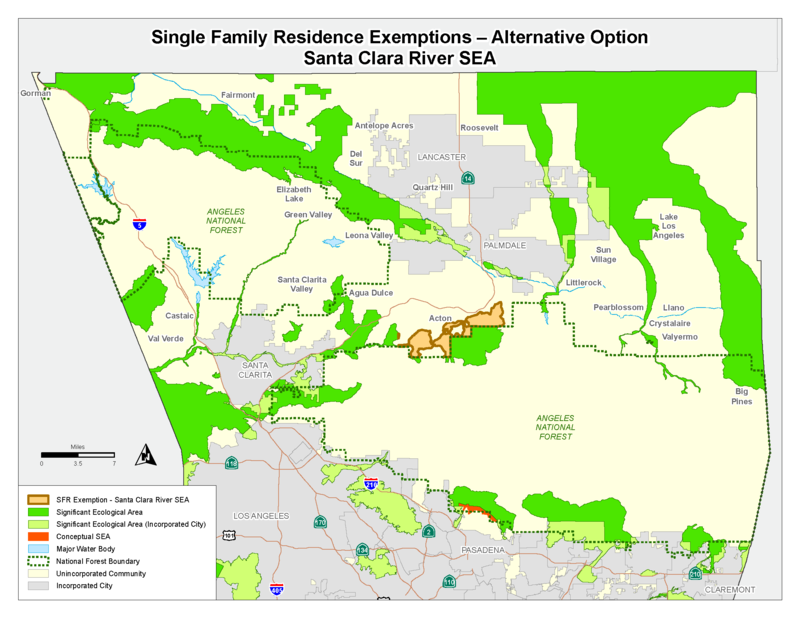 The alternative option will have the exemption, as described above, apply only to the eastern portion of the Santa Clara River SEA (shown below in orange) that is outside of the National Forest boundary. The rest of the SEAs in the AV (shown below in green) will follow the county-wide SEA regulations for single-family residences and agricultural uses. The county-wide regulations will require single-family residences and agricultural uses to undergo biological review. A ministerial review track is available if development is able to meet SEA development standards and within a 20,000 square foot building site area. A discretionary permit will be required if the development is unable to meet the requirements for ministerial review. The alternative option ordinance language below shows the changes to the boundaries of where these exemptions will apply to.